In 2010 Sherwood "Woodie" Neiss was trying to raise capital for his latest business concept, a data-polling app for smartphones. He had a track record as CFO of FlavoRx--an award-winning medicine-flavoring company he co-founded in 1999 and sold eight years later--and his new idea had won him a Startup Weekend pitch competition. But without three years of financials, the banks weren't interested in investing in his app; neither were angels, venture capitalists or the private equity investors who'd put millions into FlavoRx. Personal credit wasn't an option, either: Thanks to the recession, Neiss' Miami home was underwater, and his credit card limits had been slashed. Suddenly the capital crunch faced by so many startups after the economy tanked became personal. "I was irritated by the fact that I could do it before and now have that credibility and not be able to do it again," Neiss recalls. Many people complain without taking action. Neiss is not one of them. Along with buddies Jason Best and Zak Cassady-Dorion--all graduates of Arizona's Thunderbird School of Global Management and serial entrepreneurs familiar with the financing dance--Neiss decided to push for what he saw as a solution to his problem: crowdfunding. To him and his friends, it was crazy that businesses raising capital were still beholden to securities regulations written nearly 80 years ago--before the invention of personal computers, let alone Facebook and Twitter--and especially when so many Americans need jobs. Sitting at Best's dining room table in San Francisco, the three hashed out the changes to securities regulations they thought were needed so that entrepreneurs could raise small amounts of investment capital from friends, family and their greater communities. The plan, as Neiss tells it, was to "go to the SEC, plead our case, show them the solution, get them to craft the rules and then, boom, it's done." Now, three years later, Neiss laughs at their naiveté. The legal and policy experts the friends consulted about their plan explained that amending decades-old securities regulations would involve a lot more than simply showing up on the SEC's doorstep with a pitch. "Them saying to us, 'This will take an act of Congress,' and us saying, 'OK, well, what is that going to take?' and just foolishly going down that path led to this," Neiss says. This is the result of the year and a half he, Best and Cassady-Dorion spent schlepping back and forth from their homes in Miami, San Francisco and upstate New York, respectively, to Washington, D.C., to convince Congress to legalize equity- and debt-based crowdfunding. Forming a movement they called Startup Exemption, the trio galvanized other crowdfunding advocates--a handful of whom had also been lobbying Congress in person--along with business schools and the greater startup community, encouraging them to sign petitions, call their congressperson, you name it. "People told us we were crazy," says Neiss, who considered lobbying Congress his full-time job. "We even joked to ourselves, 'There's a 7 percent chance of this happening.' Things don't get through Congress. The fact that this got through with such bipartisan support is astonishing." 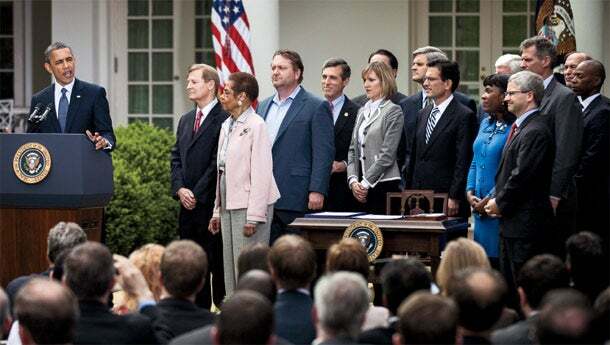 Last spring they were vindicated when President Obama signed the Jumpstart Our Business Startups (JOBS) Act into law. The trio was on hand at the White House for the event. Green light: President Obama signs the JOBS Act in April 2012. Today dozens of new investment-crowdfunding platforms and ancillary services--such as background checkers and broker-dealers--are waiting for the SEC to finalize the rules that will flip the switch on what the University of California, Berkeley, estimates will be a $4 billion market. Why place their bets on an industry that isn't even live yet? "We need to finish what we started," Best says. "We wouldn't have spent two years of our lives on this--and a lot of our own money--if we weren't passionate about it." On a brilliant blue February afternoon, Neiss, Best, Cassady-Dorion and CCA vice president of business development and strategic partnerships Robert Mitchell (another Thunderbird alum) convene in their office du jour, a roomy space with picture windows overlooking the UC Berkeley campus. Best is an entrepreneur-in-residence at the university's Center for Entrepreneurship and Technology at the Fung Institute for Engineering Leadership, an entrepreneurial program for engineering students. When any of CCA's leaders, clients or colleagues are in town, Best's office becomes company headquarters. Outside the office, the hallway bustles with educators and students. One floor up, eight teams work on projects for SkyDeck, an accelerator program that helps student startups grow their customer bases and raise capital. "The people that come through are amazing," Neiss says. Adds Best: "It's one of the top research facilities in the world." Their enthusiasm is infectious. When they lean forward and breathlessly describe investment crowdfunding as a game-changer that will benefit Americans more than any other aspect of the JOBS Act, it's hard not to share their excitement. They point out that in 2012 venture capitalists funded just 3,800 of the 27.5 million companies in America. "The conversation shouldn't be revolving around the 3,800 potential companies they're interested in. It should be revolving around the other 99.9 percent of businesses out there that need capital," Neiss says. They talk about the coming convergence of social networks and community financing, what they refer to as web 3.0. "Businesses over the last five or six years have been told by every social media consultant: You have to have likes, you have to have fans, you have to have a Twitter account, you have to create a social presence for your brand," Best says. "But I think a lot of businesses, especially small businesses, struggle to say, 'Where are the dollars? What's the ROI of that spend?' And I think this is the chance to really quantify that and to say, 'This is how you turn those likes and fans and tweets into investors, into capital for your businesses.'" In November Berkeley's Fung Institute announced a new academic program in crowdfunding, spearheaded by Neiss and Best. The idea is to draw on CCA's expertise and the university's data research abilities to develop best practices for early-stage startups and investors interested in crowdfunding. "We can test anything and everything here. It's brilliant," Neiss says. Between the researchers CCA now has at its fingertips and the best and brightest engineers developing tomorrow's startups in the accelerator upstairs, it's a crowdfunding gold mine. Once the SEC rules are finalized and investment crowdfunding gets under way, part of what CCA will be doing is feeding Berkeley data from participating investment-crowdfunding platforms for analysis. "There's going to be enough data to tell us what a dry cleaner is worth in Seattle vs. Austin," Neiss explains. Cassady-Dorion adds, "So when an entrepreneur is trying to set what their valuation is, they can look at past dry-cleaning valuations, and then investors can look back and say, 'OK, why is this one valued at 15 percent more than what the average is?'" The potential for fraud from crowdfunding has been a concern to many. But restrictions built into the new law--including caps on individual investments; an all-or-nothing rule requiring startups to hit their full target amount before collecting any funds they've crowdsourced; and the fact that U.S. crowdfunding platforms will have to answer to the SEC--provide safeguards. Unscrupulous 'treps also will have the wrath of the internet to contend with. "There are going to be online reputation systems for investors and entrepreneurs, just like there are with eBay and Amazon," Best predicts. "Those reputations will follow you." 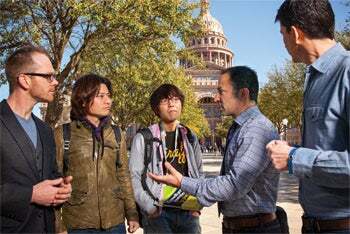 Ken Singer, managing director of the Fung Institute's Center for Entrepreneurship and Technology, was a late convert. Before learning about the regulations the SEC is crafting, he worried about the potential for fraudsters to fleece unseasoned investors. Now, though, he's not only comfortable with the idea, he's also eager to educate entrepreneurs in the best ways to go about raising investments from the public. "I see the role of this crowdfunding center as one of an umpire," Singer says. "I'd like for the center to be the voice of reason … the place where people go to see, At what point does it make sense for us to get crowdfunding, and at what point does it not make sense?" Indeed, Singer has high hopes for the university's alliance with CCA. "Almost every initiative like this that I've seen has grown and become pretty substantial with its own identity," he says. When asked what else they're working on, the guys look at each other and laugh. "What aren't we working on?" Neiss jokes. "Not being overwhelmed," Mitchell chimes in. There's a hefty research and advisory project they've been doing for the World Bank since December 2012; presentations at venues ranging from the White House and World Economic Forum to South by Southwest and Silicon Valley's Global Innovation Summit; the online training program based on their Wiley book Crowdfund Investing for Dummies; and seven new crowdfunding platforms and services the company regularly advises. Digging in: The trio in Austin for SXSW. "The guys are extremely high-energy, and they keep up an amazing pace," says client Steve Yin, co-founder and CEO of EarlyIQ, which provides background and "truthiness" checks on startups seeking crowdfund investments. "They're passionate about entrepreneurship, for sure. And the way they're getting that passion distributed is leading the charge on equity-based crowdfunding. They live, eat and breathe that." When it comes to spreading the crowdfunding word, Neiss, Best and Cassady-Dorion aren't limiting themselves to their own backyard. They have realized that investment crowdfunding--currently legal in Australia, the U.K., France, Italy and a handful of other places--could be a boon internationally. "I was speaking at an event right after the Senate passed [the JOBS Act] and right before the president signed it into law," Neiss recalls. "I was at the MIT Global Startup Workshop in Istanbul, Turkey, up on the stage, talking about how great this is going to be for the U.S. economy and how many jobs we were going to create, and it was going to be outstanding. And a student got up and shouted, 'Jobs aren't an American thing! They're a global thing!' And I thought, Wow, that's really true. This is not just a problem that we face. This is a problem that faces everyone around the globe, and this is a global solution." One of CCA's biggest international projects has been a World Bank report on how crowdfunding can positively impact entrepreneurs, investors, development organizations and governments in developing countries. Additional consulting gigs are with government officials and the startup community in Mexico, a government agency in Colombia and the heads of the coalition government in Italy. Speaking engagements have already taken Best to Qatar, the United Arab Emirates and South Africa this year. The U.S. State Department has come calling, too. Last fall, it enlisted CCA as a partner in its Global Entrepreneurship Program, which provides resources, mentorship and educational events designed to advance prosperity and job creation around the world. (The more stable a nation's economy, the thinking goes, the less likely it is to devolve into political chaos.) In its partnership with CCA, the State Department works with U.S. embassies and consulates to organize crowdfunding-policy roundtables with Neiss and Best wherever their travels take them. Shelly Porges, the former State Department senior advisor who recruited CCA as a programming partner, is confident that investment-crowdfunding markets will emerge quickly in many developed and developing nations, potentially surpassing angel investing as a viable early-stage financing model. "I think that there will be some bumps on the road as we move ahead with this thing," she points out. "Every new initiative has that, but even in the short term [as well as the] medium and long term, there's no question in my mind that crowdfunding is going to be significant." For the team at CCA, all this is validation that the months and tens of thousands of dollars they spent trying to get the U.S. legislation passed wasn't in vain. Before the JOBS Act went through, Mitchell was skeptical that U.S. investment crowdfunding would see the light of day. He admits to giving Neiss a fair amount of friendly grief about all the time he was spending lobbying Washington. "I would just needle him and say there's no way in hell, he's wasting his time," Mitchell says. "In retrospect, he said it kind of motivated him." The JOBS Act wasn't Neiss' first dalliance with D.C. In 2006, while CFO at FlavoRx, he testified before the House Committee on Small Business about his company's abandonment of its plans to go public in the face of costly, time-consuming Sarbanes-Oxley audit regulations that seemed over the top for his business. Five years later, when he, Best and Cassady-Dorion went to Washington to pressure Congress to revise the SEC rules that prevented startups from crowdfunding, they weren't the only entrepreneurs to do so. But they appeared numerous times--whenever their D.C. contacts would call to say, "How quickly can you get here?" --and by forming Startup Exemption, they unified what until then had been a disorganized group of businesspeople raging against the machine. Freeman White, CEO and co-founder of Launcht--a company that creates custom crowdfunding platforms for universities, nonprofits, incubators and business-plan competitions--credits Startup Exemption as the lightning rod that pulled the ragtag movement together. "They brought a professional appearance to the whole thing and really sustained the effort in a way it hadn't been sustained before," says White, who lived near Philadelphia at the time and traveled to D.C. about 10 times between 2011 and 2012 to lobby Congress. "And they showed up in Washington." Karen Kerrigan, president and CEO of the Small Business & Entrepreneurship Council, a 100,000-member advocacy organization, says it's rare for federal legislation to pass as quickly as the JOBS Act did. But Kerrigan, who introduced Neiss, Best and Cassady-Dorion to key members of Congress during their push to legalize crowdfunding, believed "the stars were aligning very nicely" for the JOBS Act to make its way to the president's desk. Having a dedicated team of professionals willing to walk the Congressional halls over and over again certainly didn't hurt, she says: "I'm a big believer that when small-business owners and entrepreneurs get fully engaged on a range of issues, they can really make things happen." "You can't just expect something to happen by sending a letter," Neiss explains. "It won't. You can't expect anything to happen by picking up the phone and calling. It won't. More business happens when we're sitting down face to face, sharing thoughts and ideas and passions. We like to transact with people who are right in front of us." Neiss, Best and Cassady-Dorion--and the crowdfunding advocates they've rallied along the way, a number of whom have organized into a lobbying group called Crowdfund Intermediary Regulatory Advocates--are applying those lessons to their current work with the SEC. Although the JOBS Act called for the SEC to create regulations for crowdfund investing by the end of 2012--"It's the first time an industry has had a start date," Best says--the agency has yet to deliver a draft of the rules. Since the passage of the JOBS Act more than a year ago, the SEC has met repeatedly with members of the crowdfunding industry to consider their input, learn more about crowdfund investing and see demos of some of the newest platforms. "There's a lot of focus on this issue," Best says. "The SEC has already done a lot of work, so we feel comfortable that regulations will be complete at some point before the end of the year. I think that if they weren't serious about this, they wouldn't have met with us 14 times." In the meantime, CCA continues to help those building the investment crowdfunding infrastructure that will be needed once the SEC pulls the trigger. "There is not one ounce of anything in my body that does not believe that this will turn into something incredibly huge, incredibly powerful," Neiss says. "And all the time and the energy and the money that we've poured into it will have been worth it."